In Damanhur we have learned to believe in dreams, and every day for 40 years, we have been building new dreams and keeping alive the early ones we dreamed together. The results are vibrant, magical places that inspire others to believe that the we can really change the world, make it a better place, a place where we can grow and evolve all together. If you also believe in this dream, please help us to complete a part of the Open Temple! but you can still donate via PayPal! The objective of this project is to restore the floor of the Open Temple, which is the first part of a three-part project: floor, statues and columns. At the moment only the first two steps of seven have been completed, therefore, we just need your help to complete five more. They will be resurfaced using a technique known as terrazzo which makes it possible to use the area all year round despite weather conditions such as ice and snow. As shown below, each step will be enhanced with circular spiral patterns as a symbol of life. A complex series of blue and white lines creating a walking meditation labyrinth will guide the pathway for spiritual exercises involving rhythmic steps and movements. The central mosaic will be created using an artistic technique with an aggregate of chips from red granite, carrara white and black marble. The predominant color will be red, like the original columns and terracotta sculptures. The spiral pattern in the center of each step is a recurring theme throughout the Open Temple. 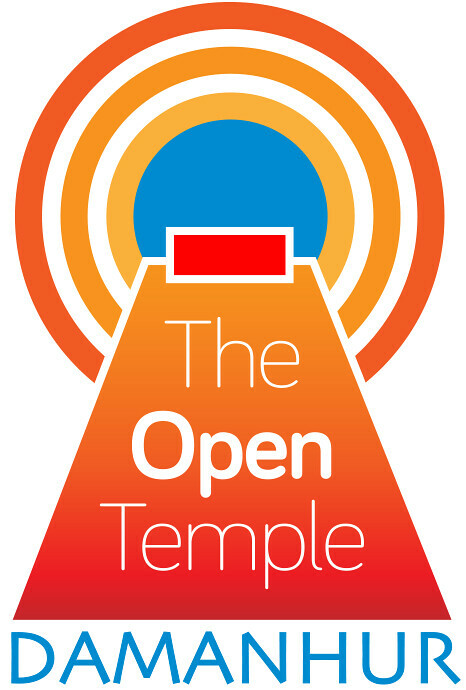 The Open Temple renovation will flourish not only with monetary contributions, but also through the energy of those who join us on this journey and send positive thoughts for its success. The Indiegogo campaign—which is no longer active—can be found here.